PLAN, EXECUTE and ENJOY ! 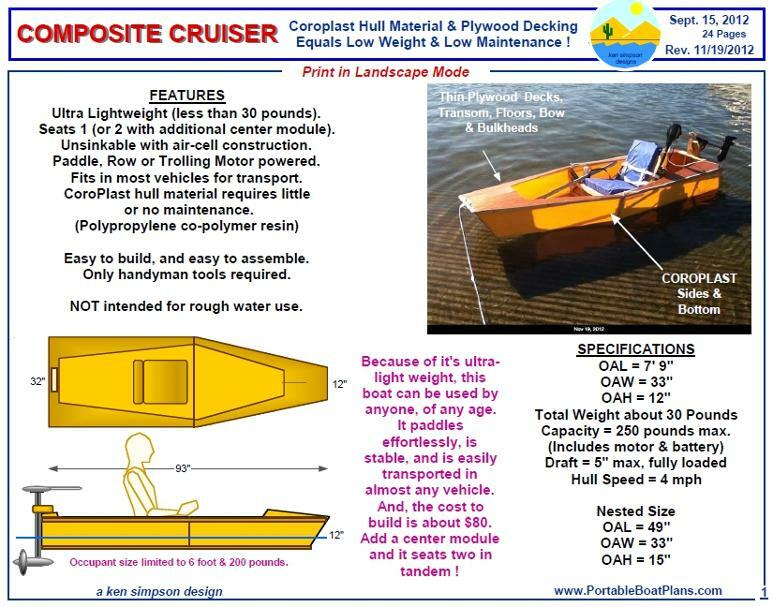 And, thank you for your interest in my Portable Boat Projects. 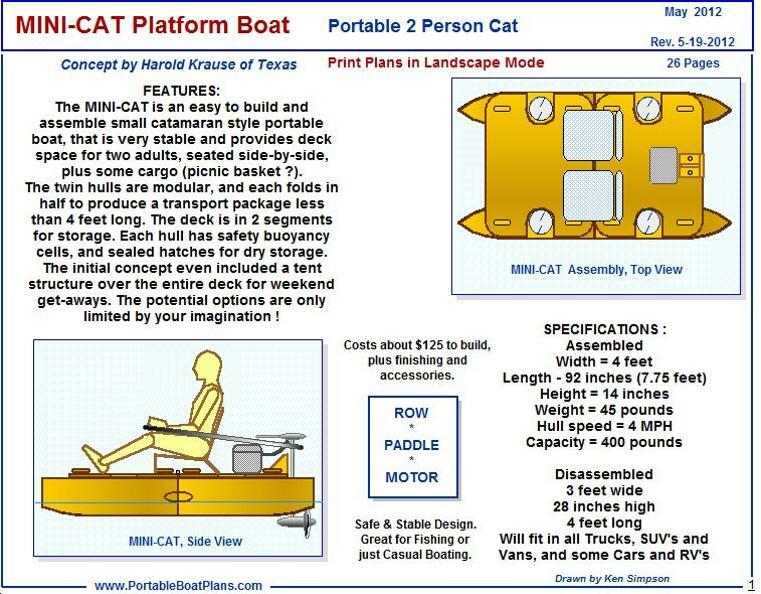 Welcome to Portable Boat Plans of Arizona. 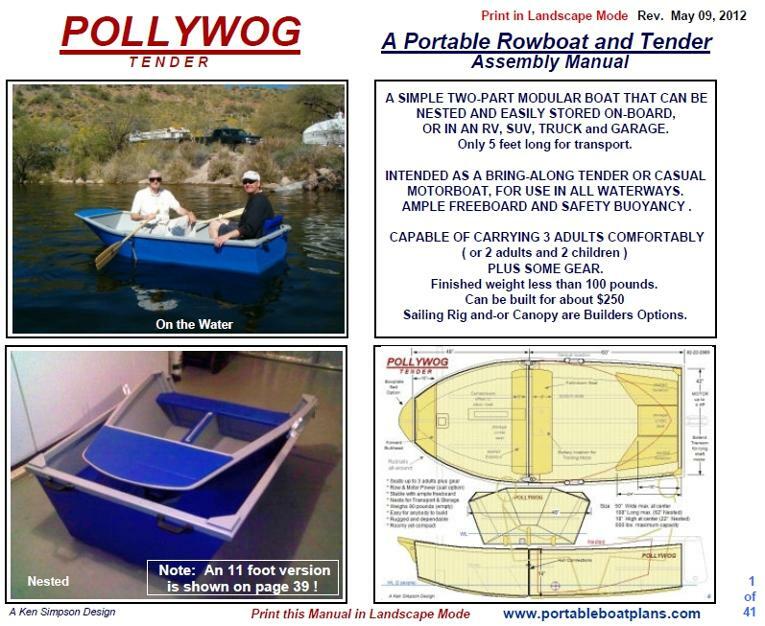 All of the Portable Boat Designs Require No Trailer for Transport ! 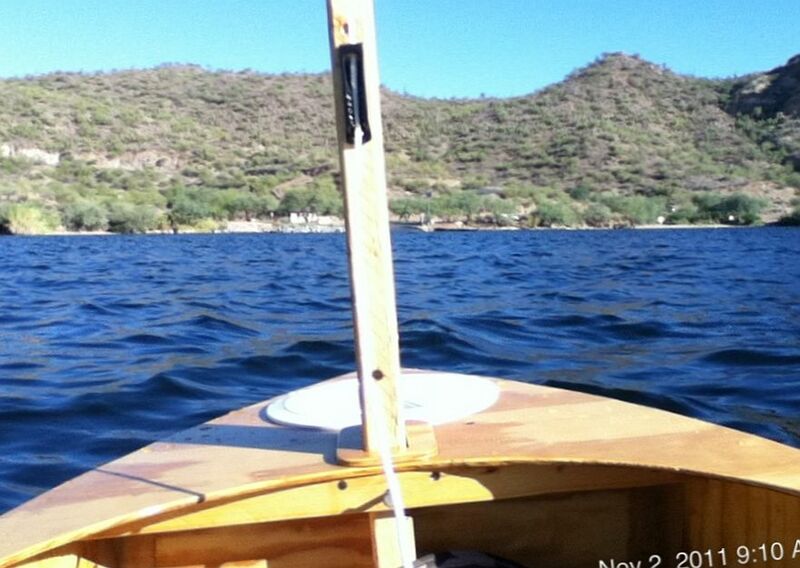 Most of the boats are easily built from readily available Plywood and TiteBond 3 Glue. Most designs incorporates the 'Tape & Glue Assembly Process' developed by the Designer. NOTE: I have added 4 new designs to the "New Design Ideas" page. Click on the NDI Tab below. 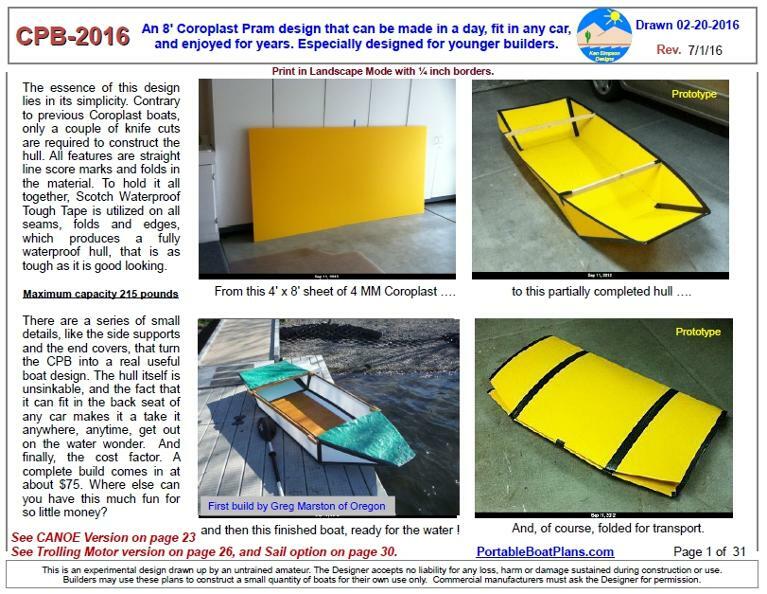 This is the latest Coroplast 7 foot Skiff hull design. It embodies all the features of past ones, with improvements. 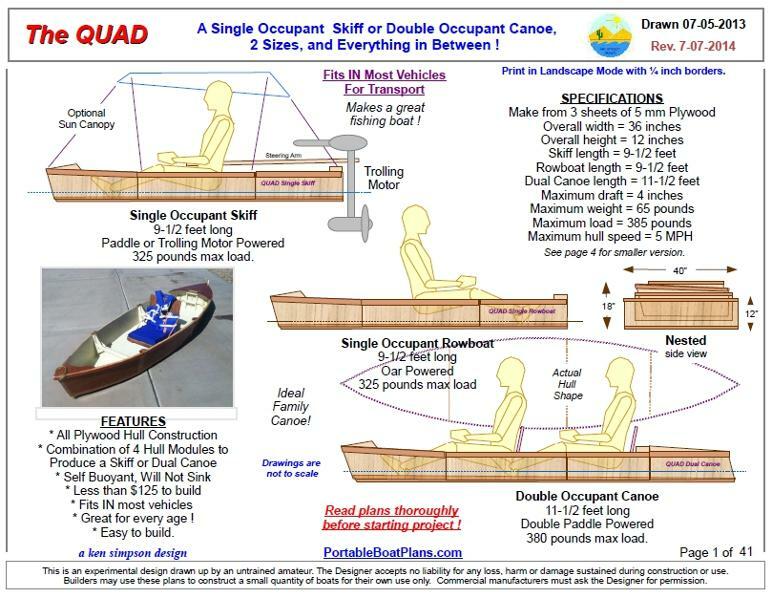 And with the addition of a rear module it becomes a 10 foot long Kayak. All can be folded to less than 6 inch thickness for transport in almost any car. 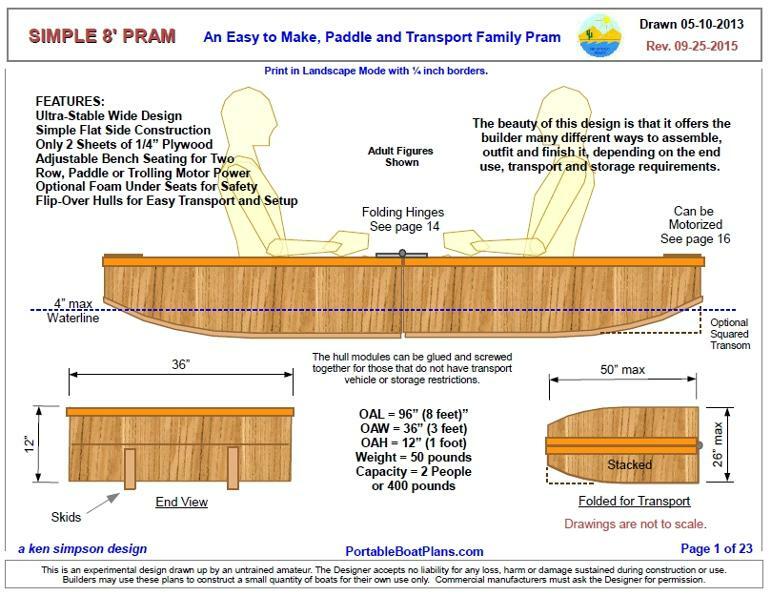 Weighing less than 20 pounds, it is ideal for poeple of all ages, and assembles in less than 2 minutes at the water. 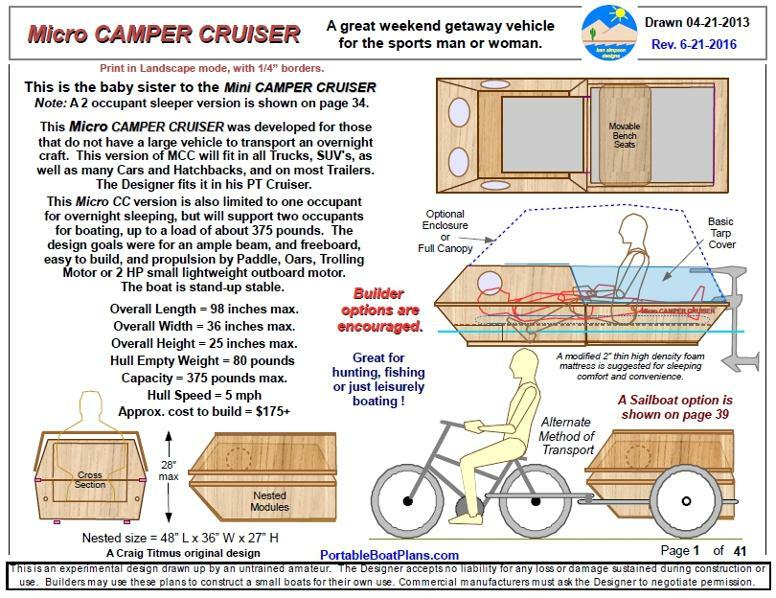 Here is another variation of the PORTABLE CAMPER CRUISER. This one is especially suited to fit in most SUV's, all Trucks and Campers. It's 3 foot width and 2 foot transport height are ideal for in vehicle storage. 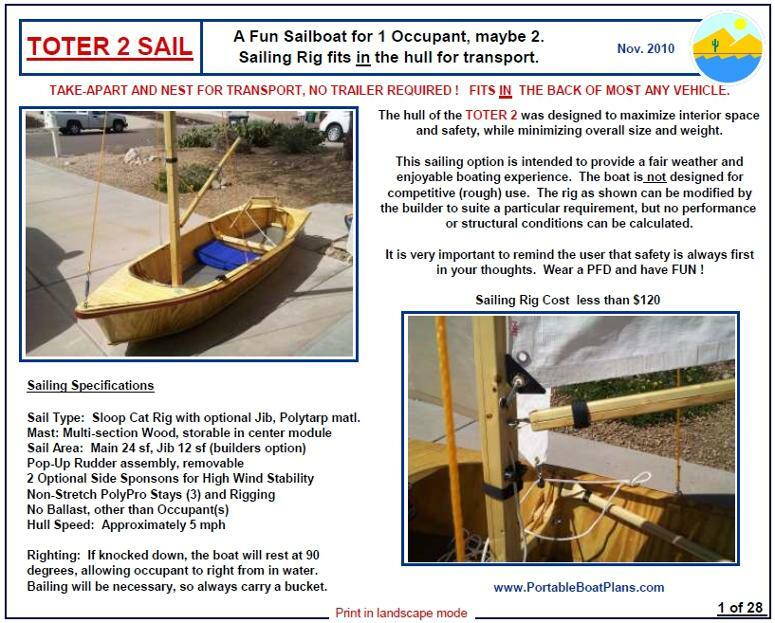 It also is dedicated to be a solo sleeper, but will carry 2 occupants in comfort for day cruising and/or fishing. Have questions? E-mail me for more information. For those that want a quick overview of some of the plans presented here, I have added a faster way of viewing those designs, and then selecting the ones of most interest to you. Merely click on the Boat Icon at right, and go to the QUICK VIEW PAGE. There, most designs are represented only by picture icons, and clicking on any one of them will take you to it's detailed plans page. Return to this Main Page for plan descriptions and free accessory plans that follow. Click on any plan below and go to the individual detail plans page. Click your browser back button to return to this main page. Free Accessory Plans available at end of page. 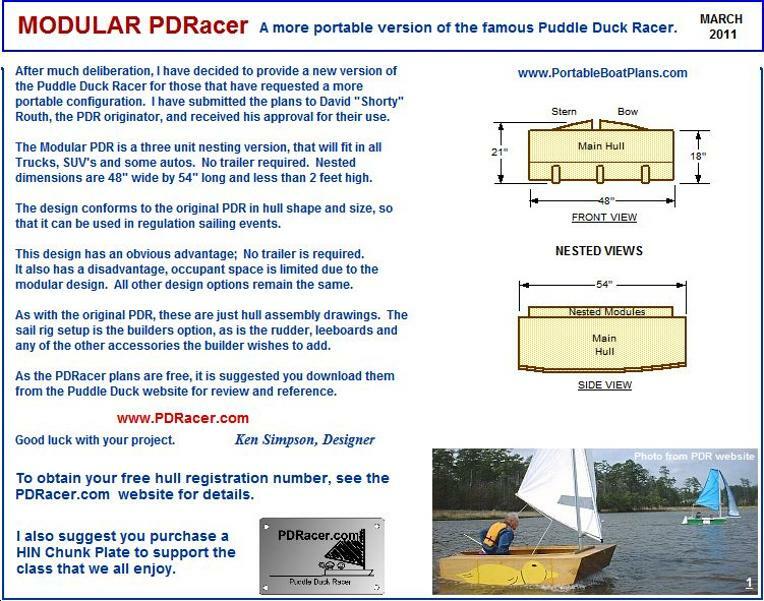 All my plans can be purchased at "Duckworks Boat Builders Supply", so "click" the link below to order. One thing that has been missing for 10 years on this site is a drawing dimension converter. Use the data below to assist in making the right calculation. 7/22/2016 - Modifications have been made to the plans, and my prototype, to provide fast assembly at the water. 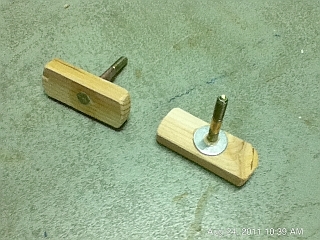 Now, only 2 assembly bolts are required, and no loose parts. So, unload from the car, unfold the panels, swing closed the supports, bolt to the side rails, add a seat and paddle away. Only takes 1 minute ! 7/28/2016 - A new assembly video has been added to the bottom of the plans page. 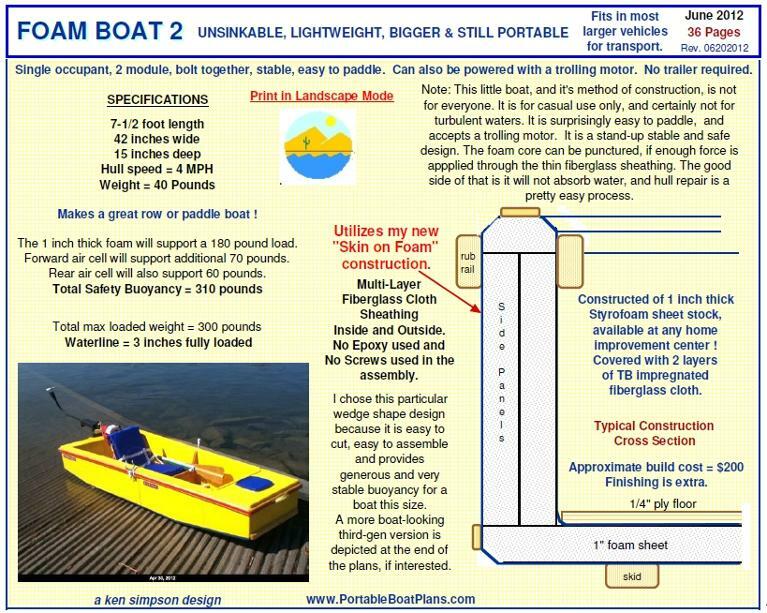 And, I want to remind you that the finished boat weighs only 16 pounds, and when folded occupies a volume of only 4 feet long, 2.5 feet wide and 6 inches thick. 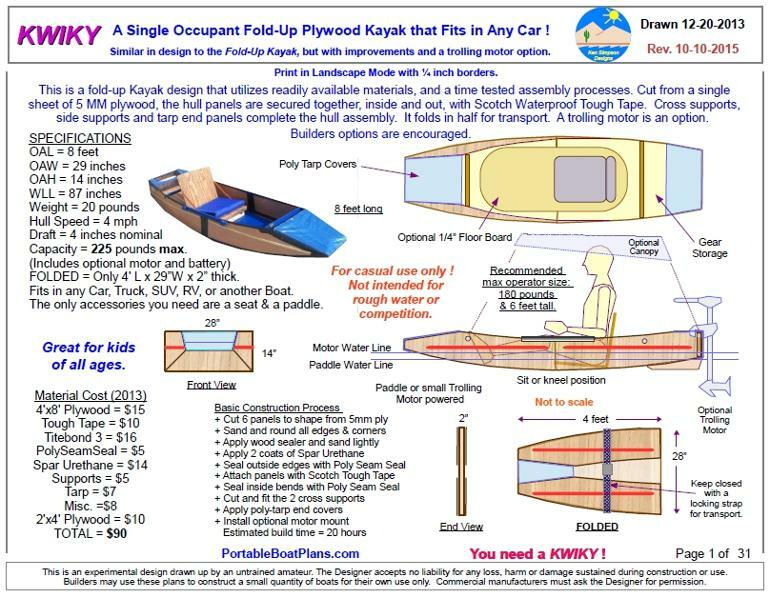 It fits in any car, is very easy to portage, and costs about $80 to make. 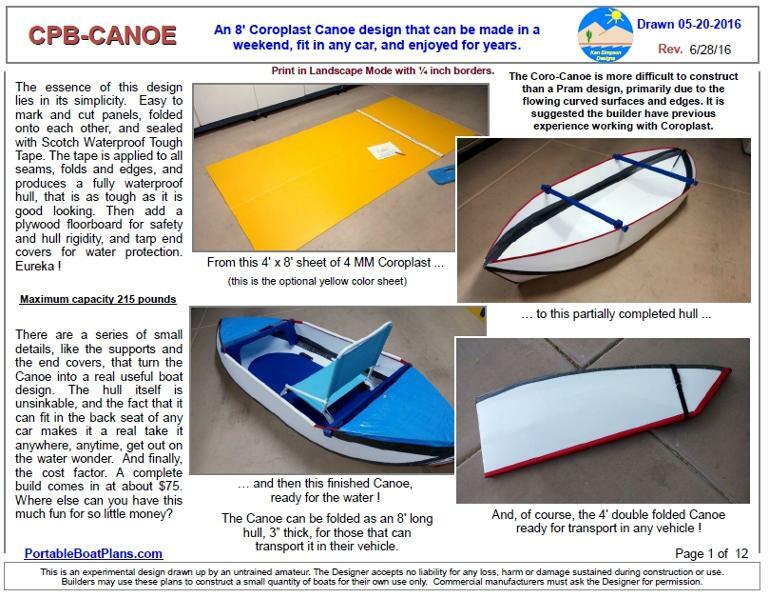 Sept. 2016 - Added additional build and in-water detail, as well as a short video of the Canoe on the water. This is a simple yet unique hull design. 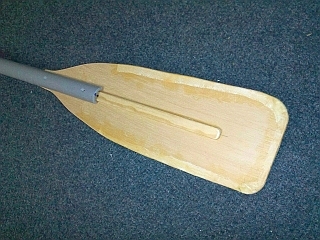 As noted in the cover page, it is stand up stable, and therefore can be used by all fishermen, and women, to safely traverse ponds and lakes, without the fear of falling out of the boat. Constructed like most of my designs, but even simpler, with all straight line cuts and quick assembly. Sept 04, 2015: - A 2 occupant sleeper version has just been added to the plans. It is 48 inches wide, and can support up to 500 pounds. 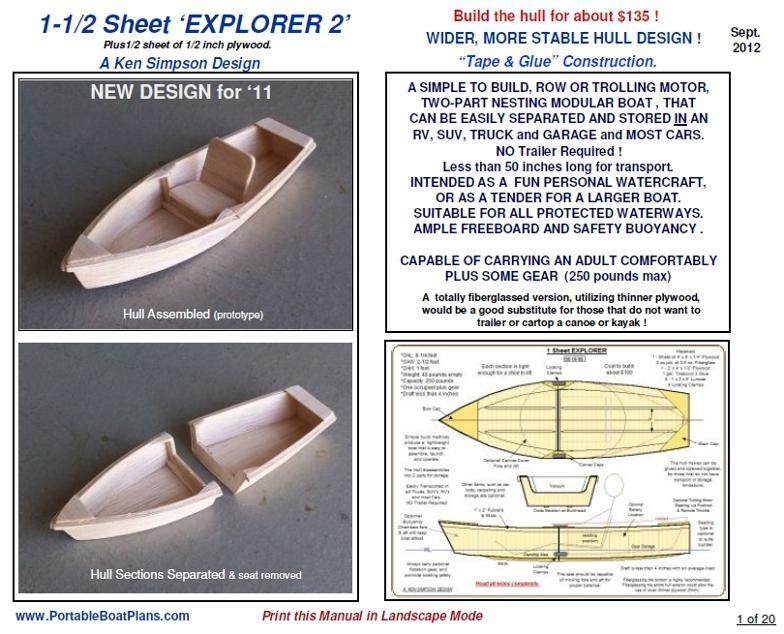 Sept. 20, 2016: The final page of the plans was developed, hull & motor testing at the lake. 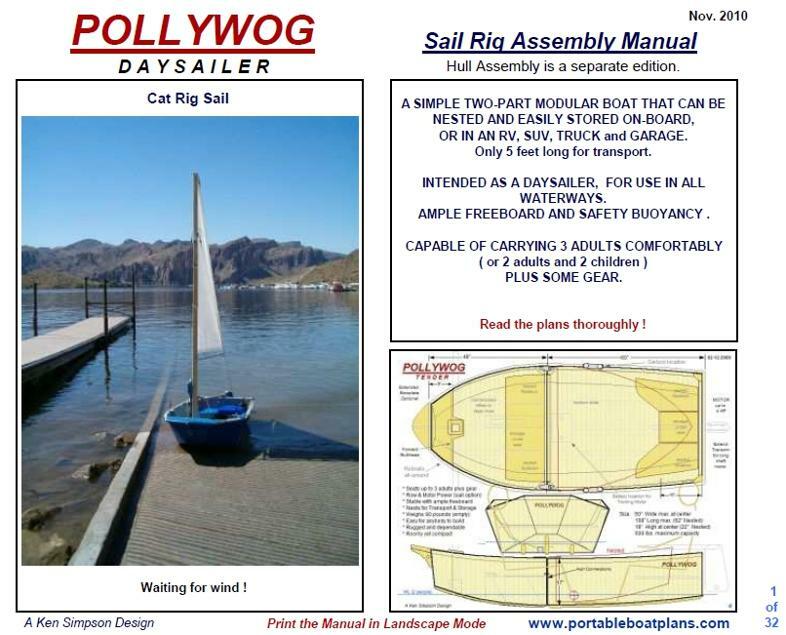 Dec. 3, 2016: Build for the Sail Option is complete, waiting for good weather for testing. FREE for the asking ! 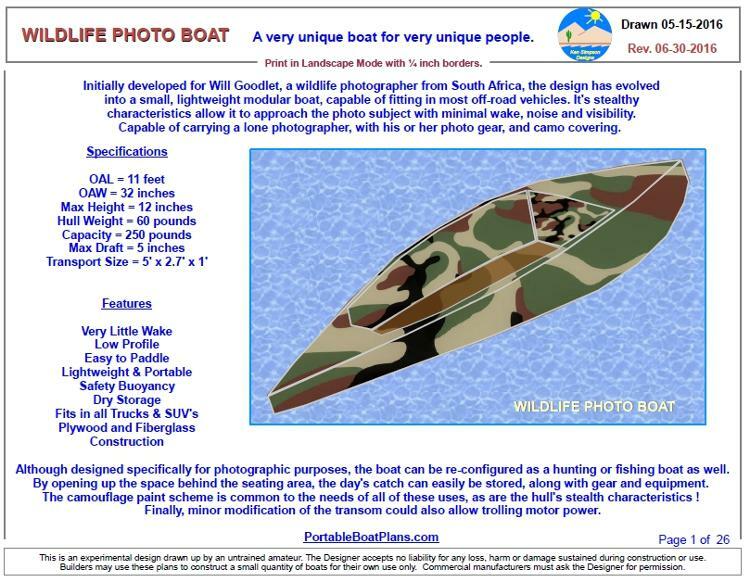 Just for your information, many of my boat designs can easily be modified to suite your particular application. As an example, the new F.I.T. 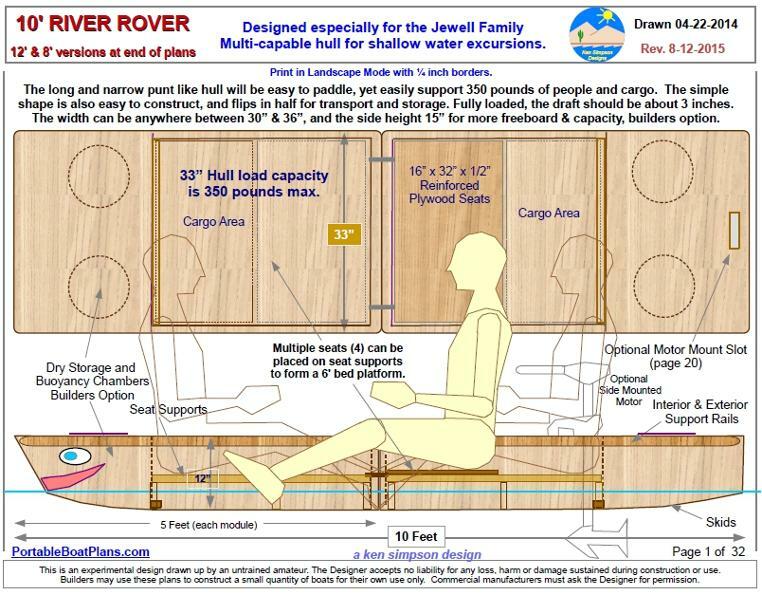 plans depict larger versions to accommodate bigger people, or greater loads. 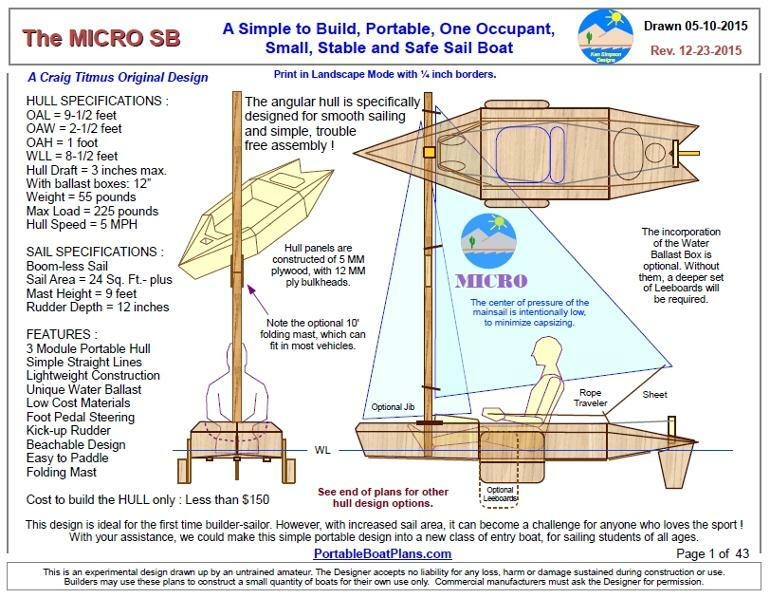 And the MICRO CC plans define a wider hull, for those who don't want to go it alone. All the plans are open to your imagination! Just a short note defining why my videos rarely include views of the entire boat, or anybody in them. Well, I almost always go out alone, and as a result, it is impossible to to get the whole scene, as my arms are just not long enough. However, the accompanying still photos should provide more than sufficient hull views to satisfy the need of most of the readers of this website. And, thank you for your continued support. 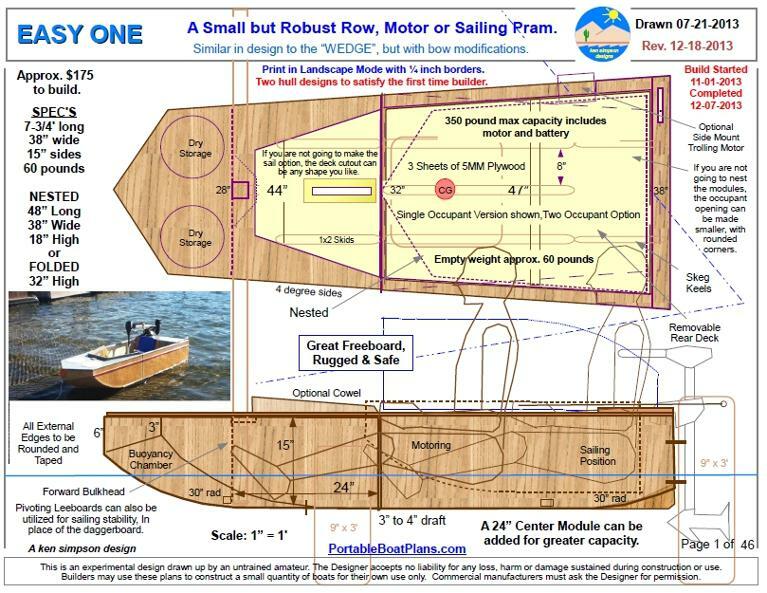 As you may know, most of my boat plans utilize my "Tape & Glue Process" in their construction. It has been brought to my attention by various builders over the years, that some of the materials specified on the plans are not available in other Countries. If this is so, the use of thin Fiberglass Cloth Tape and Epoxy are probably the best alternates. 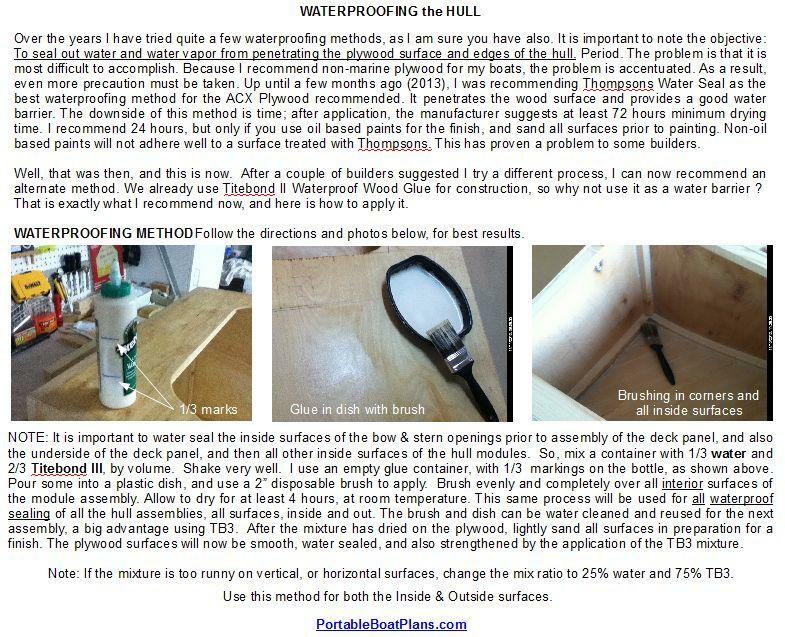 Normally I do not suggest their use because of their higher cost, and the fact many people are allergic to epoxy resin. All these plans can be downloaded FREE from the individual listings below. ASSEMBLY KNOB - It was only a matter of time before it was obvious that a quicker method of fastening the hull modules together was developed. This knob essentially takes the place of a wrench, and makes the installation of the hull assembly bolts a much easier process. The single page plans are FREE to download. 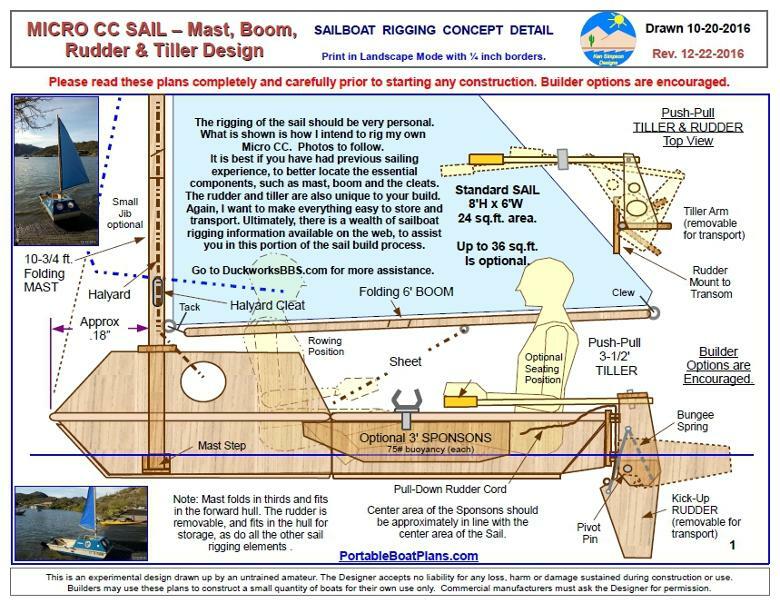 FOLDING MAST & BOOM - This is a clever way to get a 12 foot object into a 6 foot container. 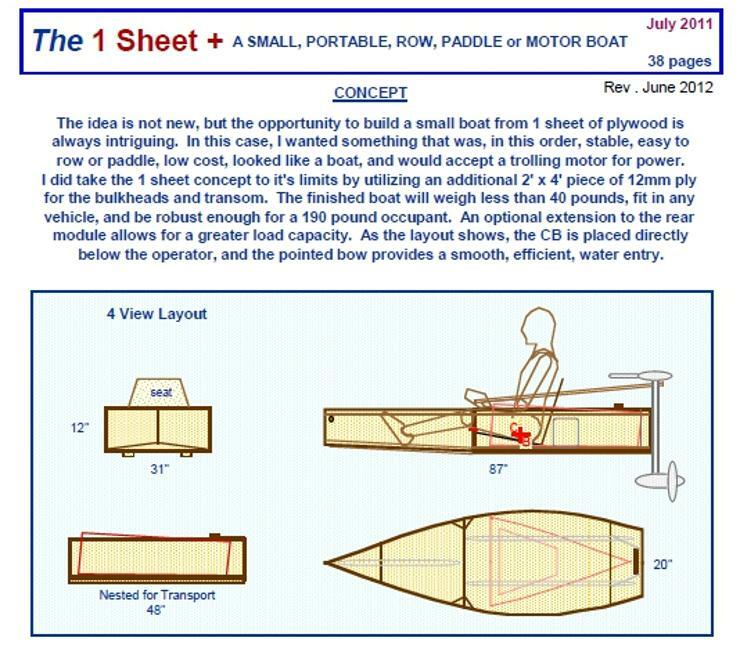 By using everyday available components, the mast and boom of most small sailboats can be made to fold in half for transport in your vehicle, not on it. 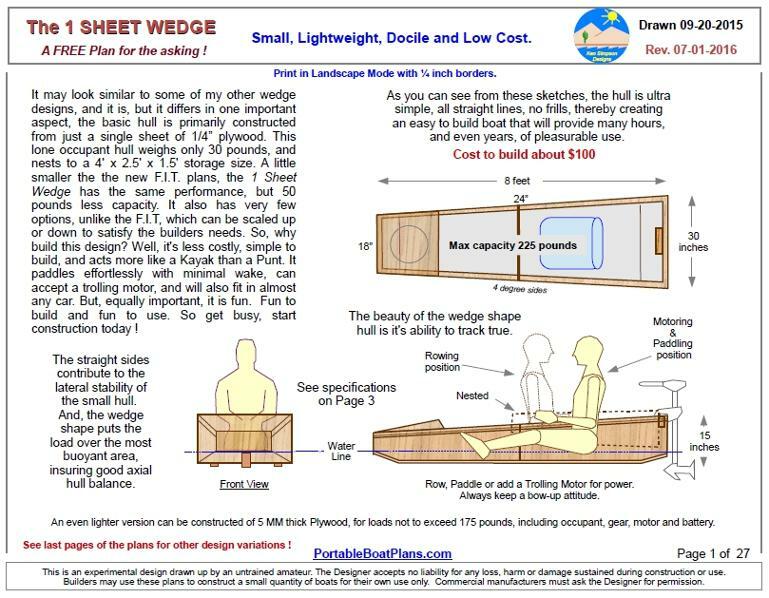 Originally designed for the WEDGE, but applicable to all my sailboat designs. FREE to download. 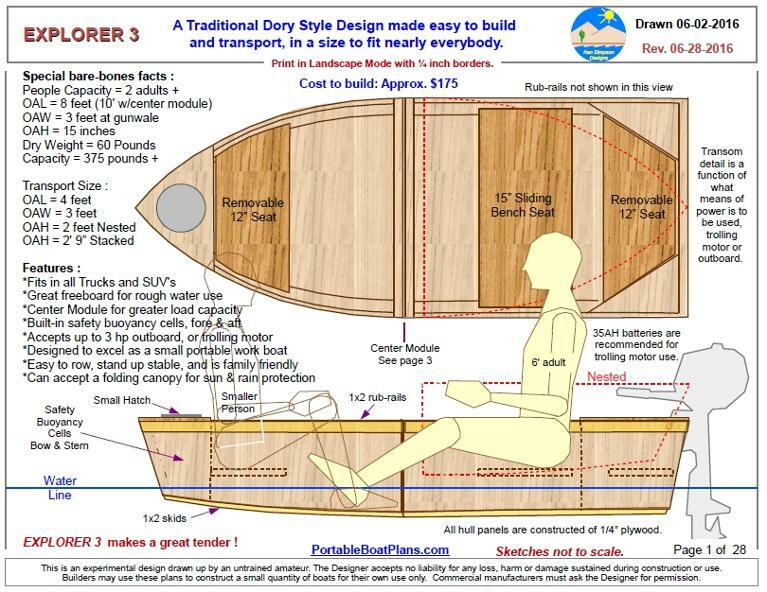 FOLDING PLYWOOD SEAT - This design can be used on any of my boats that do not specify fixed seating. Easy to make, low in cost, about $15. Big enough for even the large person, the angle back can be adjusted to suite individual needs. 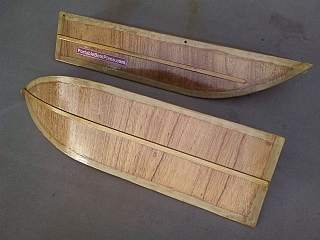 Made of 1/2 inch plywood, can be painted to match your boat. Increase comfort by adding back and seat cushions. The plans are FREE. 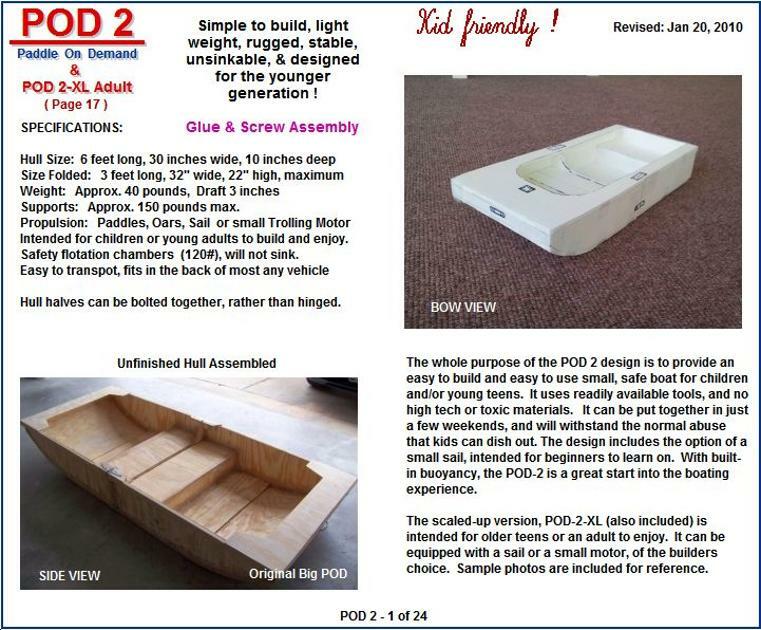 And here is a great article on the basic use of Materials & Tools by Jim Michalak. 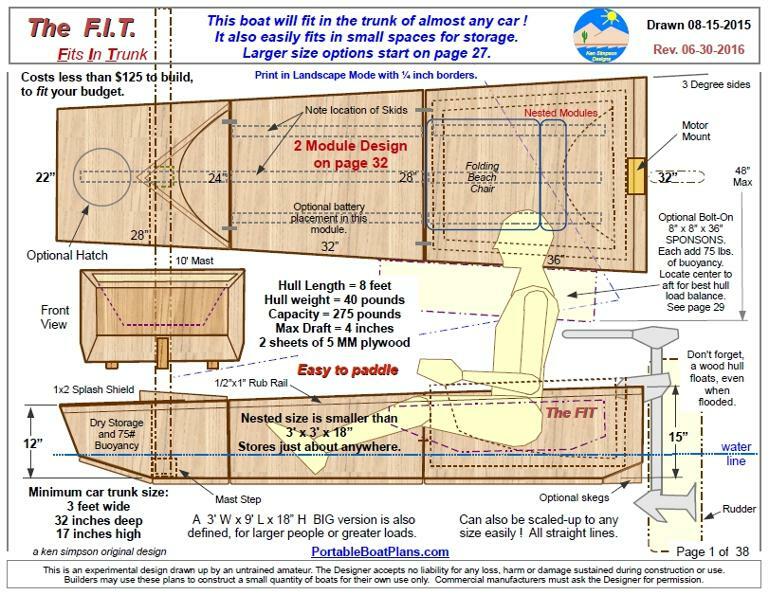 This should be required reading for all first time boat builders. Download the PDF file below (click on title). Wait for the file to load, then select Save or Print. 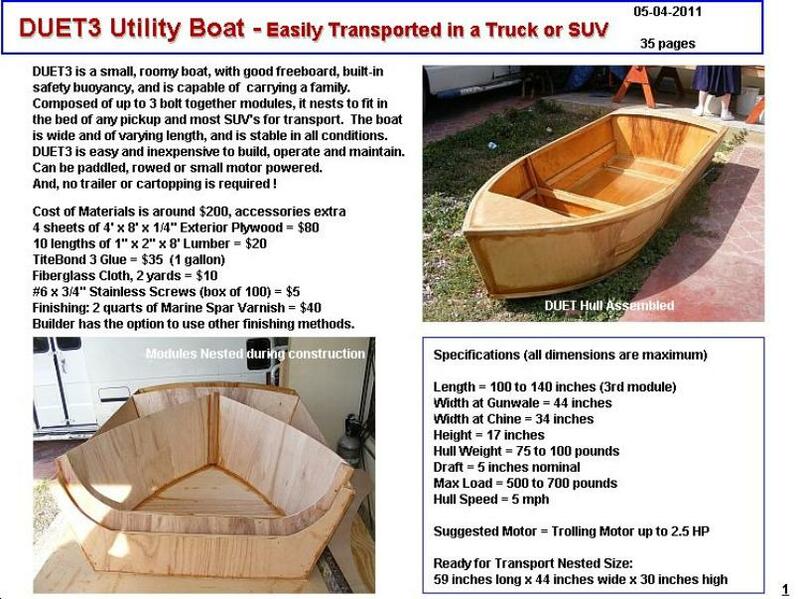 Also go to http://www.svensons.com/boat/ for some old, but good, boat designs. 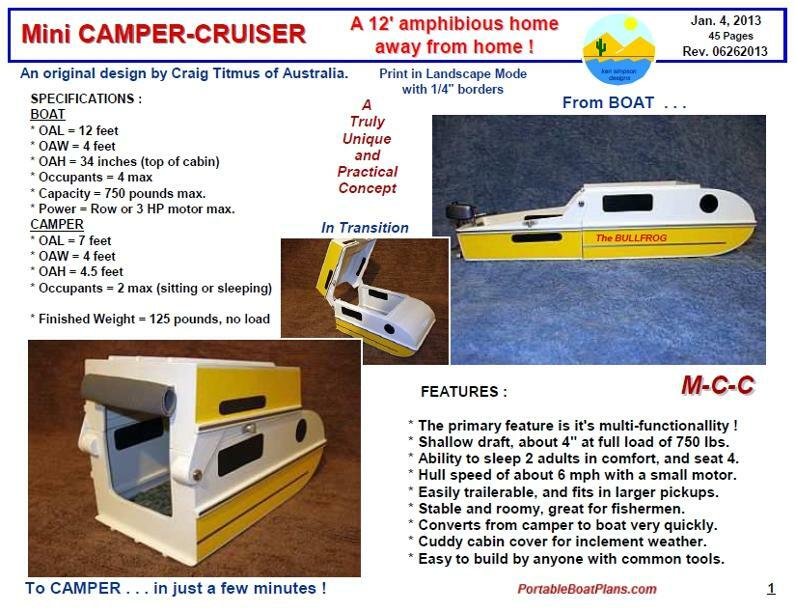 Or visit http://www.storerboatplans.com/ , a great Australian boat designer. And, of course, Duckworks Boat Builders Supply. 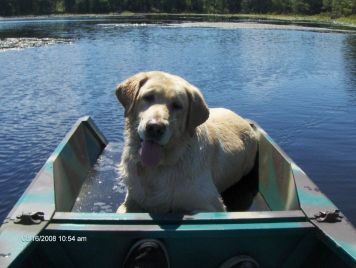 It's always better when man's best friend enjoys the small boating experience in one of our designs. Say Hello to Jake ! 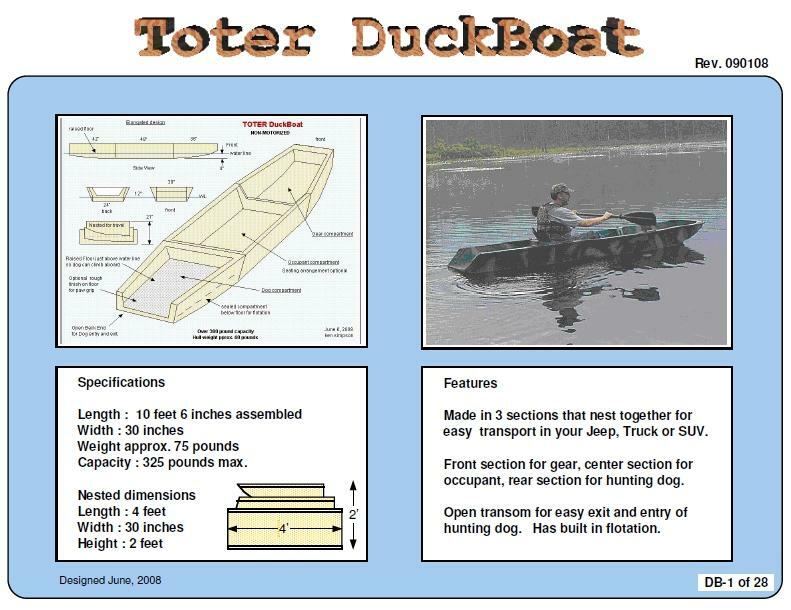 DUCKWORKS is the best place to look for boat building plans, supplies and articles. A Boat Builders Best Friend. 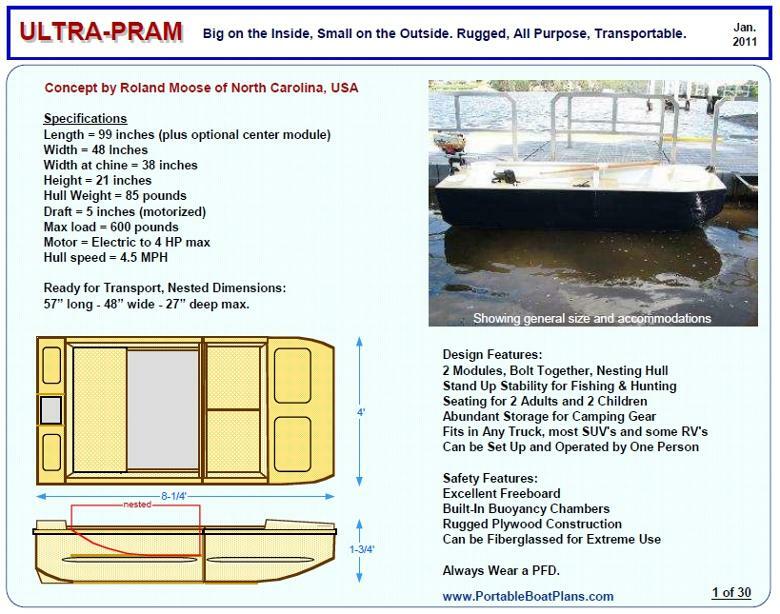 It is the intent of this plans website to provide two things for the small portable boat building community. First is to provide ideas and information of interest that will motivate a prospective builder into action. 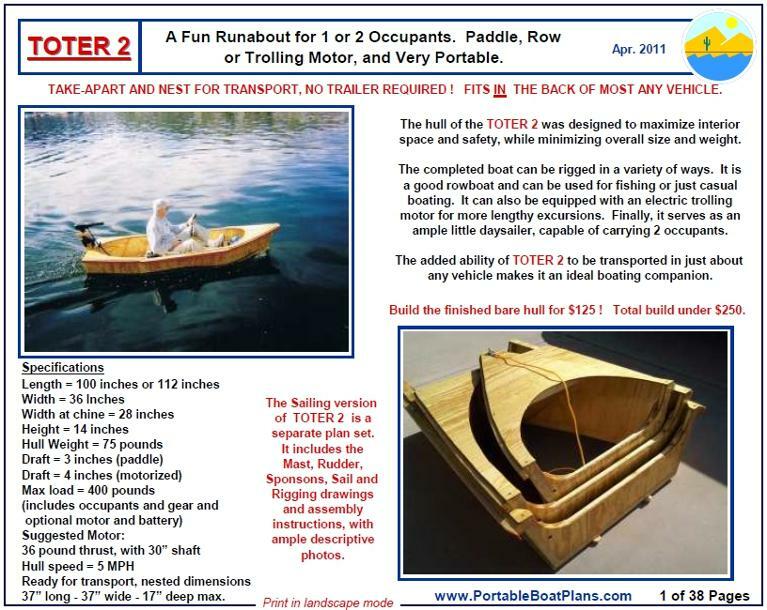 Second is to provide plans for boats that are affordable, easy to build, usefull and always fun. 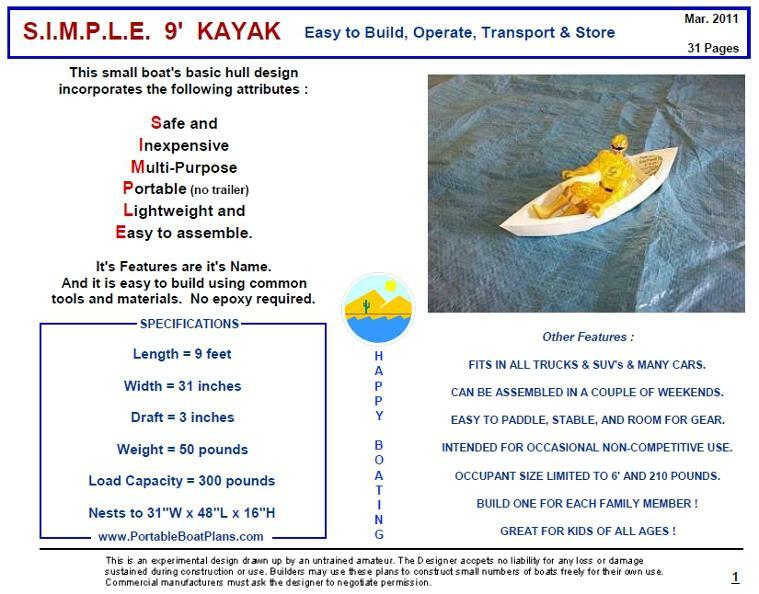 builder to make an educated decision regarding their boat of choice. inquires of design, construction and material selection. Have a question or comment? Leave it below and I will answer them all. 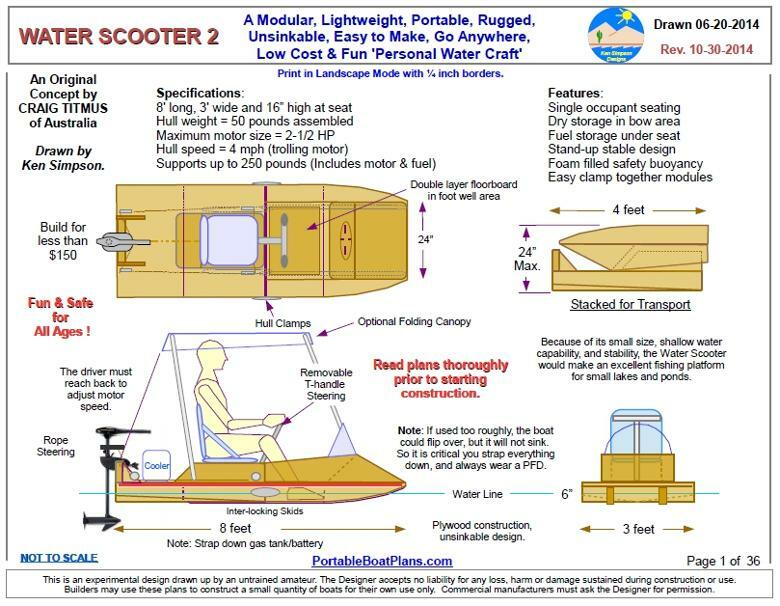 The boat plans listed here are the sole creation of the designer, Ken Simpson. 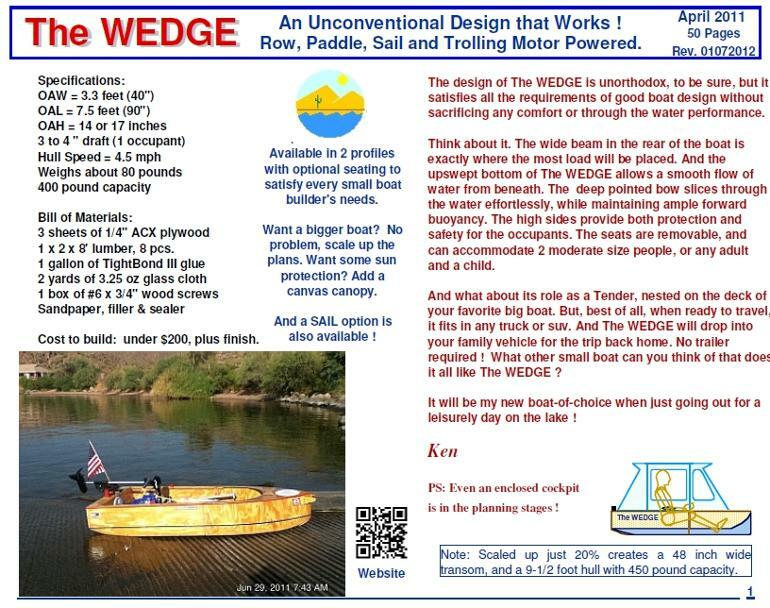 It is his ongoing goal to design and develop small transportable boats that are easy and affordable to build. Although each design is unique, intended for a specific purpose, all share common assembly techniques. 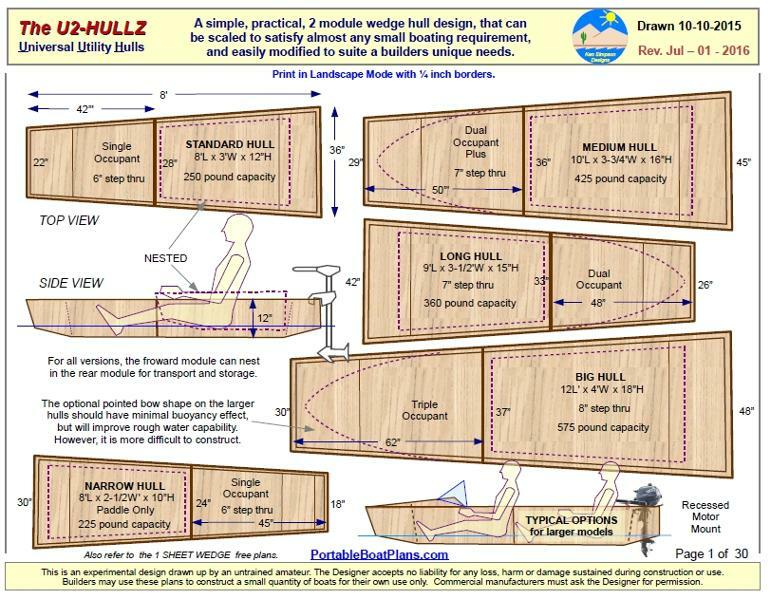 For instance, there are very few, if any, hull forms used in construction of these boats, as the bulkheads and transoms, combined with the mounted side panels, create the basic hull shape. The glue of choice for all construction is TiteBond III, a waterproof wood glue. No epoxy specified, or used. All seams are treated with layers of glass cloth tape impregnated with TiteBond III. This method was developed by the designer, and many boats of different sizes, up to 12 feet in length, have been successfully built using the process, now called the ' Tape & Glue Method of Assembly '. That being said, the designer takes no responsibility, and cannot be held liable for any construction faults, personal injury, or any other result of the builders actions or materials, on or off the water. Also, the plans cannot be used for commercial purposes without the designers specific written permission.